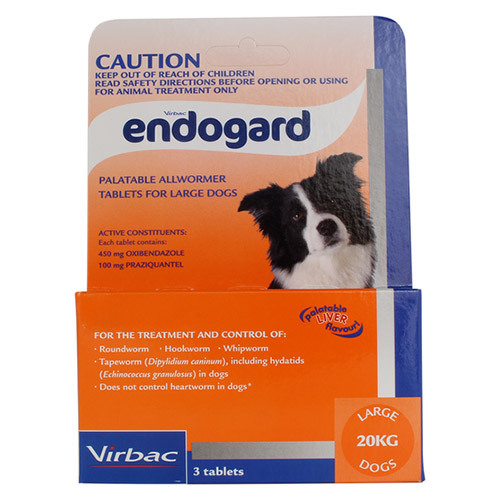 Endogard is a liver flavored tablet for treating allwormers. This worming tablet is used in the treatment of mixed worm infestations in adult dogs and puppies. The oral worm control product treats Nematods, Ascarids: Toxocara canis, Toxascaris leonina (late immature forms and mature forms), Hookworms: Uncinaria stenocephala, Ancylostoma caninum (adults), Cestodes Taenia spp., Dipylidium caninum. It prevents severe infection and protects dogs from harmful effects. It does not prevent heartworm infection in dogs. 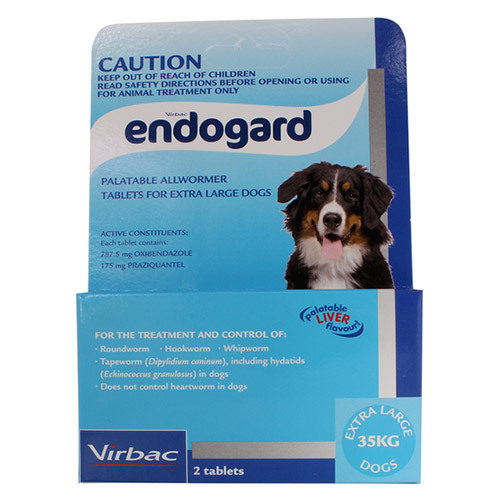 Endogard contains two main ingredients - praziquantel and oxibendazole. The first ingredient Praziquantel is effective in controlling tapeworms in dogs and the other ingredient oxibendazole treats other intestinal worms in dogs. Oxibendazole is an ultimate product that is used as an annual rotational treatment to help reduce the possibility of resistance against pyrantel based dewormers. It is a comprehensive parasite control product extensively prepared for dogs. It is necessary to weigh your dog before treatment. Administer the dosage according to your dog’s weight. Directly give it through mouth or mix it in dog feed. Ensure that your dog completes the whole meal for proper dosage. 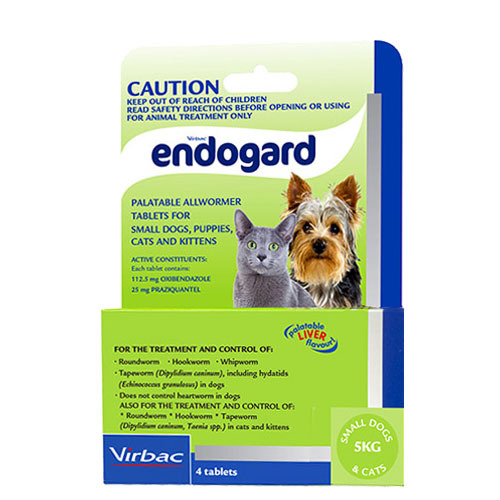 Endogard is one of its kinds dewormer for effectively treating all types of intestinal worms in dogs and puppies. It kills and prevents different worms like roundworms, hookworms, whipworms and tapeworms. When combined with heartworm treatment, it is effective in protecting dogs from harmful health conditions. The flavored tablets are easy to administer. This unique formula also helps to prevent the spread of intestinal worms to other dogs, humans and the surroundings. It is for veterinary use only. Store separately from edible items. 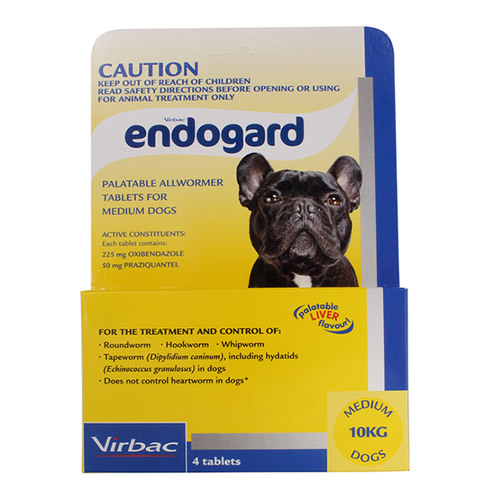 Do not treat puppies less than 2 weeks of age with Endogard. Do not treat puppies weighing less than 2 Kg. Do not treat puppies and dogs allergic to ingredients present in the product. My dog had hookworm infection a couple of weeks back. After treating him with endogard, his diarrhea subsided within a day. Now he seems healthier than he was, previously. I swear by this product. Every time my dog is affected by worms I just start dosing him with Endogard and so far it has worked efficaciously. I am using this dewomer on my dog for a few years now and never had any issue of worms. So, I can say it is working perfectly well.